Article received on the 7th of April 2013. Article accepted on the 2nd of May 2013. Mihaela Rugină M.D, “C.C. Iliescu” Emergency Institute of Cardiovascular Diseases, Fundeni 258 Street, 2st District, 022328, Bucharest. Abstract: Left ventricular noncompaction (LVNC) is a cardiomyopathy associated with sporadic or familial disease, the latter having an autosomal dominant mode of transmission. Echocardiography is the current gold standard for diagnosis of this entity, but with the risk of over diagnosis and under diagnosis. There are frequent doubtful cases, that need multimodality confirmation (echocardiography and magnetic resonance imaging). The clinical features associated with LVNC vary from asymptomatic to symptomatic patients, with the potential for heart failure, supraventricular and ventricular arrhythmias, thrombo­embolic events, and sudden cardiac death. There is no therapy specific for patients with LVNC. The treatment focuses on the complications of the disease. Rezumat: Noncompactarea de ventricul stâng este o cardio­mio­patie sporadică sau familială, cea din urmă având o trans­mitere autozomal dominantă. Ecocardiografia este stan­dardul de aur actual în diagnosticarea acestei afecţiuni, cu toate că acestă metodă implică un risc de supradiagnostica­re sau subdiagnosticare. Există frecvent cazuri incerte, în care o abordare multimodală este necesară, corelând rezultatele ecocardiografice cu cele obţinute prin rezonanţă magnetică. Tabloul clinic variază de la pacienţi asimptomatici la pacienţi cu insuficienţă cardiacă, aritmii supraventriculare sau ventriculare, evenimente tromboembolice şi moarte subită cardiacă. Nu există tratament specific al noncompactării de ventricul stâng. Tratamentul are ca scop prevenirea şi tratarea complicaţiilor bolii. Left ventricular noncompaction (LVNC) is a cardio­myopathy with genetic determinism, that it is not widely accepted like a distinct cardiomyopathy, still being considered a congenital or aquired morphological characteristic of other different cardiomyopathies1. In the position statement of the European Society of Cardiology, LVNC is included in the unclassified cardiomyopathies group because it is not clear whether it is a separate cardiomyopathy or merely a morphological trait shared by many phenotypically distinct cardiomyopathies2. The American Heart Association classified LVNC as a primary cardiomyopathy. The characteristic echocardiographic features in individuals affected by LVNC include a thick, bilayered (compacted and noncompacted) myocardium; proeminent ventricular trabeculations; and deep intertrabecular recesses. The population prevalence of isolated LVNC is not known, but it is reported in 0.014% -1,3 % of consecutive echocardiograms. In large paediatric series, LVNC is reported to be the commonest cause of unclassified cardiomyopathies3. In some reports, LVNC is more frequent in men than in women (1,5:1)4. This poor estimation of the LVNC prevalence is partially explained by the non uniform diagnostic criterias used. The prevalence of LVNC has raised because of a better echocardiographic identification. The various names used to describe the morphologic profile of LVNC include ‘‘honeycomb,’’ ‘‘persistent sinusoids,’’ ‘‘spongy myocardium,’’ ‘‘persistent embryonic myo­cardium’’, ‘‘hypertrabeculation,’’ ‘‘LVNC,’’ ‘‘LVNC/hyper­trabeculation syndrome,’’ and ‘‘noncompaction of the ventricular myocardium5. Briefly, in the development of the heart, the myocardium has a trabeculated aspect with deep intertrabecular recesses. This stage is encountered before the development of coronary arteries. In the 5 to 8 week of gestation the compaction of the myocardium has place, the intertrabecular recesses becoming the coronary arteries. The process of trabecular compaction in humans starts at the base and progresses toward the apex. Compaction is most pronounced in the left ventricle, and substantial growth and compaction occur throughout postnatal development. LVNC is hypothesized to be due to early cessation of compaction of trabecular meshwork during embryogenesis. The result is an epicardial layer that is compacted and an endocardial layer with prominent trabeculae and deep intertrabecular recesses that communicate with the left ventricle cavity. Because the apex is the last to undergo compaction, ventricular noncompaction is usually localized toward the apical region. There have been described familial and acquired form of LVNC. The discussion against the developmental hy­pothesis comes from serial echocardiographic studies where LVNC was not diagnosed on initial echocar­diogram but was becoming evident in subsequent examinations. Recent advances in genetics, however, raise the question whether LVNC can also develop postnatally. Some genes have been linked to the development of LVNC: tafazine, β-distrobrevine (DTNA), Cyber/ZASP (LDB3), laminine A/C (LMNA), SCN5A, MYH7 and MYBPC31,3. Some genes involved in LVNC are also involved in hypertrophic cardiomyopaty and dilated cardiomyopathy (genes that encodes sarcomeric proteins)6. There are report of some association between LVNC and congenital cardiac defects. For example, Barth syn­drome is a X-linked disorder (G4.5 gene in Xq 28 region) characterised by LVNC, dilated cardiomyopathy, neutropenia and skeletal myopathy1,6. Histologically, LVNC is defined by deep intertrabecular recesses which communicate with the left ventricular cavity. Fibrosis has been described in multiple reports with endomyocardial thickening and subendocardial fibroelastosis. Several reports have observed necrotic myocytes within the prominent trabeculaes, but not in the epicardial layer. Those trabeculaes are often localized near the apex and papillary muscles are not totally developed7. The two layers of myocardium and the trabeculaes are vascularized by the coronary arteries, and the intertrabecular recesses are getting blood from the ventricular cavity. In the development of the heart, there arise a mismatch between the myocardial mass and the number of capillaries. In conclusion, there is a hypo perfu­sion of the endocardial myocardium despite normal epi­cardial coronary arteries. This amount of ischemia is responsible for the progressive fibrosis that ultimately will depress the systolic function of left ventricle and pre­dispose to ventricular arrhythmias. The excessive trabeculation will compromise the diastolic function of left ventricle, also8. We should permanently consider LVNC a potentially thromboembolic disease, because the blood stagnate in the intertrabecular recesses predisposing to clots formation, that can embolise in the systemic circulation8. The asymptomatic period is very different, but it is estimated that the mean time from the beginning of symptoms to the diagnosis is about three years10. The triad of heart failure symptoms, arrhythmias and embolic events is the major clinical manifestation in patients with reduced systolic left ventricular func­tion and is comparable in adult and paediatric populations. Various patterns of arrhythmias, ranging from atrial fibrillation (7-26%) to sustained ventricular tachycardia (41%), can be observed. There have been reported cases presenting with atrioventricular block, left bundle branch block and sudden cardiac death11. Incidental and familial discovery of LVNC has been associated with high probability of a stable course over several years, whereas patients with symptoms of HF, histories of sustained ventricular tachycardia, or enlarged left atrium have an unstable clinical course and a grave prognosis18. The symptoms can vary widely: atypical chest pain, syncope, systemic and pulmonary embolism. It is important that mortality and morbidity is proportional to the severity of systolic dysfunction of left ventricle. – WPW pattern in young patients. Electrocardiography can be normal in 13% of patients12. A ratio of 1,29 between compacted and non compacted myocardium is considered normal. There are some nor­mal variants, like: hypertrabeculated left ventricle and septomarginal trabecula. The most used and vali­dated method of diagnostic is echocardiography. Se­veral echocardiographic and magnetic resonance imaging definitions for the diagnosis of LVNC have been proposed and used in published studies. 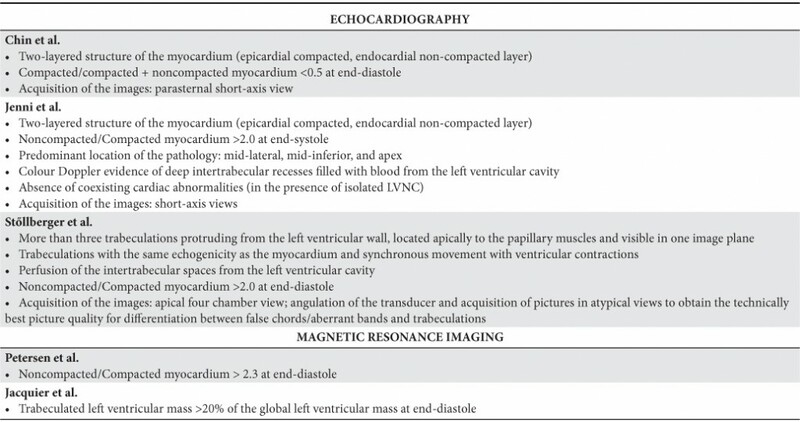 There are thee sets of echocardiographic criteria (Chin, Jenni and Stollberger) and two sets of magnetic resonance imaging criteria (Peterson and Jacquier) (Table 1). Table 1. Echocardiographic and magnetic resonance imaging diagnostic criterias for LVNC (modified by 3). Although all of the proposed definitions attempt to describe the morphology of LVNC, there is variability in these definitions. The lack of a true ‘‘gold standard,’’ such as a reliable genetic marker, makes it difficult to know whose criteria are ‘‘best’’ and ought to be used preferentially. Echocardiography. Chin et al. defined LVNC as a ratio of compacted/compacted + noncompacted myocardium <0.5 at end-diastole (using parasternal short-axis for the apex and apical views for the left ventricle free wall)10. Jenni el all defined LVNC as ratio of noncompacted/ compacted myocardium > 2 measured at end systole (using apical short-axis view)13. Stollberger defined LVNC as trabeculations (≥ four trabeculae) protruding from the left ventricle wall, lo­ca­ted apically to the papillary muscles and visible in one imaging plane14. Each sets of echocardiographic criterias used have advantages and disadvantages15. Jenni et al. criterias, using end-systolic thickness, were validated against autopsy as well as other structural heart disease. Also with autopsy confirmation, Chin et al. criterias, using end-diastolic measurement, allow for optimal measurement of noncompacted and compacted myocardium in some cases. There are observation that the measurements of the thickness of each layer of the bilayered myocardium are made more precisely during end-diastole, like in Chin’s criterias, than during end-systole, like in Jenni’s criterias. Some observational studies have reported that the thickness of noncompacted myocardium do not change during cardiac cycle unlike compacted myocardium that increases its thickness during systole because its contractile reserve5. According to this data, Jenni’s criteria has higher specificity and lower sensitivity than Chin’s criterias27. There was poor correlation among the three echocardiographic definitions, with only 30% of patients fulfilling all three criteria15. Those criterias tends to over­diagnose LVNC, because 8% of healthy individuals fu­l­filled one criteria15. Echocardiography tends to overestimate de prevalence of LVNC in black individuals. Speckletracking echocardiography (STE) gives promising result in borderline cases, because LVNC affects the left ventricle twist16. Echocardiographic pitfalls. A good echocardiographic exam depend on the experience of the investigator and it is important to have a very good echocardiographic window. The oblique section (frequently the short axis view) generates a lot of inconclusive or false positive results. There are some normal variants that prone to confusion: hypertrabeculated myocardium, septomarginal trabecula, papillary muscles. Frequently, it is very hard to visualize the left ventricle apex and a lot of cases of LVNC localized at the apex are missed3. Cardiac magnetic resonance (CMR) imaging. Peter­son et al. and Jacquier et all’s have elaborated some magnetic resonance imaging criterias for defining LVNC (Table 1). CMR has been successfully used to distinguish myocardial trabeculations from global LV mass. A trabeculated LV mass > 20% of the global LV mass is regarded as a sensitive and specific finding for the diagnosis of LVNC17. CMR approaches are evolving and may hold promise for more accurate identification of LVNC. Others investigations. Positron emission tomography (PET), which quantitatively evaluates myocardial blood flow and coronary flow reserve, may be used to assess microcirculatory dysfunction ultimately responsible for the wall motion abnormalities. Cardiac catheterization is used when there is a cardiac congenital defect in association with LVNC. The typical features of IVNC have also been observed by ventriculography. After injection of contrast me­dium, the ‘‘loosened’’ myocardium can be identified. However, a left ventricular angiogram and corona­ry angiography are usually performed to rule out other concomitant cardiac abnormalities and not for the diag­nosis of LVNC. Differential diagnosis between dilated cardiomyopathy and LVNC can be a challenge in dilated ventricles. There have been identified some risk factors in patients with LVNC, like: age at initial presentation, NYHA class, sustained ventricular arrhythmias, the extent of non compaction, left ventricle end diastolic diameter (Table 2). Despite limitations of the published risk factors for adverse outcomes, they are helpful to guide treatment, including medical therapy and device therapy20,21. In a larger series of patients, long-term follow up (39 months) showed that 35% died, half of them because of sudden cardiac death, and 12% (four patients) had undergone heart transplantation. The high incidence of both thromboembolic events (24%) and ventricular tachycardia (41%) in that series underscores the poor clinical prognosis for patients with impaired left ventricular function19. Table 2. Prognostic factors in LVNC (modified by 3). There is no therapy specific for patients with LVNC. Treatment for noncompaction of the ventricular myocardium focuses on the 3 major clinical manifestations: heart failure, arrhythmias, and systemic embolic events. Patients with LVNC that develop systolic or diastolic heart failure should be managed according to the guidelines in use22,23. The beneficial effects of the β-blocker carvedilol on left ventricular function, mass, and neurohormonal dysfunction in an infant with LVNC have been described24. When heart failure is progressive, despite maximum medical therapy, device therapy should be considered. Cardiac transplantation has been used for those with refractory congestive heart failure. Patients with LVNC should be closely evaluated for ventricular arrhythmias. Because of the frequency of ventricular tachycardia and significant risk of sudden cardiac death and systemic embolism, assessment for atrial and ventricular arrhythmias by ambulatory ECG monitoring should be performed annually. Patients with LVNC and sustained ventricular tachycardia or ventricular fibrillation require implantable cardioverter-defibrillator implant. Radiofrequency ablation also may be a consideration. Prophylactic implantable cardioverter-defibrillator implant in the absence of documented hemodynamically significant ventricular tachycardia is currently not recommended25. Prevention of embolic complications is an important management goal and remains a matter of debate in these patients. The incidence of thromboembolic complications ranges from 5% to 38%26. Because deep intertrabecular recesses with sluggish blood flow aggravate the risk of thrombus formation, it is recommended oral anticoagulation (target INR 2.0–3.0) in patients with impaired systolic function (LV ejection fraction ≤40%), previous history of trombembolism, transient ischemic attack, being aware of the absence of any robust data to support this approach3. Anticoagulation therapy, however, must be targeted to the individual patient after careful assessment of the benefit and risks. There have been used some metabolic cocktails, with somewhat good result in children: B1 and B12 vitamin, Q10 coenzyme and carnitine. This results are explained by the high frequency of the mitochondrial abnormalities in patients with LVNC. There are no guidelines for exercise prescriptions or restrictions for LVNC in the literature. Even in the most recent review of this subject by Oechslin and Jenni in 2011, no mention is made of the advisability of exercise restriction or prescription. This is a large gap in clinical practice that needs attention through further systematic evaluation of these patients to understand the risk exercise poses to this subset of patients3. It is reasonable to reevaluate the patients biannually. The patients must be put on a waiting list for heart trans­plantation, especially symptomatic patients. We should not forget the screening of relatives. Knowledge and understanding about aetiology, embryogenesis of the myocardium, genetic background, diagnosis and outcome of LVNC have steadily improved. Non-compaction of the left ventricular myocardium is within a diverse spectrum of myocardial morphologies/ cardiomyopathies triggered by gene defects/mutations: the causal role of LVNC in the pathogenesis of a distinct cardiomyopathy is questionable. LVNC results from an arrest of normal ventricular myocardial maturation by heretofore unknown molecular mechanisms. The resulting bilayered ventricular myocardium is prone to LV diastolic and systolic dysfunction, HF, arrhythmias, and thromboembolic complications. Echocardiography is the current gold standard for diagnosis of this entity. Echocardiographers and clinicians have to be cautioned not to overdiagnose LVNC. Newer imaging approaches and technologies may continue to redefine diagnostic criteria for this unusual and distinct cardiomyopathy. There is no therapy specific for patients with LVNC. The treatment focuses on the complications of the disease. Conflict of interests: The authors declare that no conflict of interest exists. 2. Elliott P, Andersson B, Arbustini E, Bilinska Z, Cecchi F, Charron P, Dubourg O, Kühl U, Maisch B, McKenna WJ, Monserrat L, Pankuweit S, Rapezzi C, Seferovic P, Tavazzi L, Keren A. Classification of the car­diomyopathies: a position statement from the European Society Of Cardiology Working Group on Myocardial and Pericardial Diseases. Eur Heart J. 2008 Jan;29(2):270-6. 3. Oechslin E, Jenni R. Left ventricular non-compaction revisited: a distinct phenotype with genetic heterogeneity? Eur Heart J. 2011 Jun; 32(12):1446-56. 6. Zaragoza MV, Arbustini E, Narula J. Noncompaction of the left ventricle: primary cardiomyopathy with an elusive genetic etiology. Curr Opin Pediatr. 2007 Dec;19(6):619-27. 9. Jenni R, Oechslin EN, van der Loo B, Isolated ventricular non-compaction of the myocardium in adults. Heart. 2007 Jan; 93(1):11-5. 10. Chin TK, Perloff JK, Williams RG, et al. Isolated noncompaction of left ventricular myocardium: a study of eight cases. Circulation 1990; 82:507-13. 11. Ritter M, Oechslin E, Sütsch G, et al. Isolated noncompaction of the myocardium in adults. Mayo Clin Proc 1997;72:26-31. 13. Jenni R, Oechslin E, Schneider J, Attenhofer Jost C, Kaufmann PA. Echocardiographic and pathoanatomical characteristics of isolated left ventricular non-compaction: a step towards classification as a distinct cardiomyopathy. Heart 2001;86:666-71. 14. Stollberger C, Finsterer J. Left ventricular hypertrabeculation/noncompaction. J Am Soc Echocardiogr 2004;17:91-100. 15. Kohli SK, Pantazis AA, Shah JS, Adeyemi B, Jackson G, McKenna WJ, Sharma S, Elliott PM. Diagnosis of left-ventricular non-compaction in patients with left-ventricular systolic dysfunction: time for a reappraisal of diagnostic criteria?, Eur Heart J. 2008 Jan;29(1):89-95. 16. van Dalen BM, Caliskan K, Soliman OI, Nemes A, Vletter WB, Ten Cate FJ, Geleijnse ML. Left ventricular solid body rotation in non-compaction cardiomyopathy: a potential new objective and quantitative functional diagnostic criterion? Eur J Heart Fail 2008;10:1088-1093. 17. Jacquier A, Thuny F, Jop B, Giorgi R, Cohen F, Gaubert JY, et al. Measurement of trabeculated left ventricular mass using cardiac magnetic resonance imaging in the diagnosis of left ventricular non-compaction. Eur Heart J 2010;31:1098-104. 18. Murphy RT, Thaman R, Blanes JG,Ward D, Sevdalis E, Papra E, et al. Natural history and familial characteristics of isolated left ventricular non-compaction. Eur Heart J 2005;26:187-92. 20. Stanton C, Bruce C, Connolly H, Brady P, Syed I, Hodge D, Asirva­tham S, Friedman P. Isolated left ventricular noncompaction syn­dro­­me. Am J Cardiol 2009;104:1135-1138. 21. Punn R, Silverman NH. Cardiac segmental analysis in left ventricular noncompaction: experience in a pediatric population. J Am Soc Echocardiogr 2010;23:46-53. 23. Hunt SA et al., ACC/AHA 2005 guideline update for the diagnosis and management of chronic heart failure in the adult: a report of the American College of Cardiology/American Heart Association Task Force on Practice Guidelines, J Am Coll Cardiol. 2005 Sep 20;46(6):e1-82. 24. Toyono M, Kondo C, Nakajima Y, et al. Effects of carvedilol on left ventricular function, mass, and scintigraphic findings in isolated left ventricular non-compaction. Heart. 2001;86:e4-e6. 25. Weiford BC, Subbarao VD, Mulhern KM, Noncompaction of the ventricular myocardium, Circulation. 2004 Jun 22;109(24):2965-71. 26. Lofiego C, Biagini E, Pasquale F, Ferlito M, Rocchi G, Perugini E, et al.Wide spectrum of presentation and variable outcomes of isolated left ventricular non-compaction. Heart 2007;93:65-71. If you wish to receive the Romanian Journal of Cardiology, even if you are not a member of the Romanian Society of Cardiology, please fill in the form below, the annual cost (4 issues) being 195RON. RO28BTRL04101205M6647601, opened at Banca Transilvania, the Division for Medical Doctors from Cotroceni.